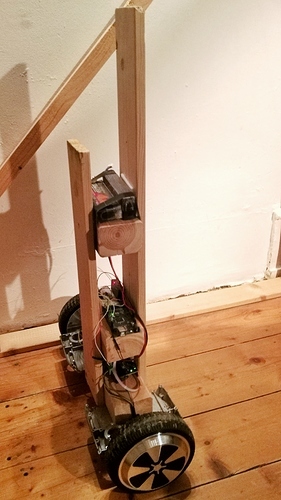 A radio controlled two-wheeled self balancing vehicle. The build is very simple. It uses two current-controlled hoverboard motors with hall sensors and the ODrive as explained here and the auxiliary capacitors as explained here. It runs off a 6S Lipo battery with 22.2V nominally. Equipped with a BNO055 IMU and controlled at 100Hz from an Arduino that gets its commands from an RC receiver via PWM. I am working on a similar project ! I am using an arduino to do the low level control of the inverted pendulum. Is it possible that your share the Odrive configuration, since you don’t use speed control ( I assume by readinbg your code you are using direct current torque control) ? Wow this is what I am looking for … could you please explain the full details with schematic diagram and coding thanks a lot .